I’ve started doing something that has greatly decreased my wallet (and life) clutter and made it easier to keep track of my many memberships, discount cards, etc. Basically, I have every membership number saved in my phone, organized to be alphabetized together such as ‘aMemb-Barnes&Noble, aMemb-Southwest, aMemb-Avis, etc’ so they are easy to find. 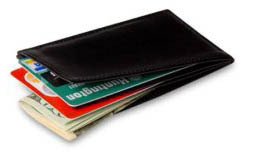 It has uncluttered my wallet/purse and made is substantially easier to find the number when I need it. This is a really simple idea. Also, if you have BlueTooth on your phone and it talks to your address file on your computer, you’ll have a backup of your membership numbers in case of emergency. Thank you, Danielle, for the tip. I also make a mental note of what stores can look up you info via a phone number or name. For example, I never carry my Barnes & Noble card because all they need is the home phone. Oh my gosh, what a GREAT idea! They don’t really need the card, do they … just the number? I’m doing this today and throwing away all those annoying cards. My wallet is fat PRIMARILY because of those discount cards. I have actually stopped signing up for them for that reason, however, I feel like I’m missing out on rewards by doing that. Thanks so much for the suggestion. The only change to the suggestion that I would make is that the name begin with “xMemb…” This would sort it to the bottom so that you still have your primary phone contacts first. I do this with business contacts (my doctor, that radio station I call when they have contests, my favorite restaurant for reservations, etc.). This is a great suggestion. I will implement it today. However an enhancement would be to have the bar code entered into the phone so that it could be scanned into the bar code reader to avoid having to read the number to the individual needing the number. I understand that the technology is now available for airlines to give boarding pass information via bar code on the cell phone. I do the same thing, but they’re all listed under a fake name. My dear friend Zelda has many different phone numbers, in case my phone ever gets stolen. Just so long as you don’t add passwords, too! I like this idea. I keep my student ID # and other needed but not memorized numbers in my phone, too. I can see how it might be a bit inconvenient to pull out your phone and look the number up every time you’re at checkout though. How about a more low-tech way of cutting down on the number of cards you carry? I use the back of a business card to jot down those numbers, so instead of having 10 plastic cards, I have one slim business card with the information on it. I went on a solo long-distance bike tour last summer, and did something similar to this. Rather than try to remember the 4 digit combination lock number and my new debit card PIN, I just put them in my phone. That way I didn’t have to worry about waking up in my tent one morning with amnesia, unable to unlock my bike or get any cash! I input membership and frequent user club numbers into an extra field on my iPhone. I keep one for Southwest, hotel club numbers, etc. Next step would be to append a photo of the original card in the contact. I used the site Just One Club Card to print out one card with all my membership numbers/bar codes on it. I love this idea. I recently purchased a small Vera Bradley simplified wallet at our local waterslide resort, can you imagine? I’ve copied the pictures, I hope they take. Okay, my lame brain can’t figure out how to enter the picture. However, I am loving my new wallet. It’s great, but it does clutter my phonebook which is neatly organized by first name and last name. That said, if you’re lucky enough to have a smartphone, keep a document on it that stores all this info. In fact, even better, is to keep the companies as full fledged contacts. For instance, keep the address and phone number of Barnes and Noble, and keep the customer info as notes. Works well in Apple Address Book. So, instead of giving the salesperson the card to scan you read the number to them? @ Celeste ….. thank you for this!!!!!! One the other hand, if you are one of those people who loses their cell phones a lot, you might want to think twice about this one. I keep mine in my front pocket. It isn’t going anywhere. But many women, including My Better Half, keep theirs in purses. Guess what usually falls over in the car or in the closet, spilling its contents? Yup. The purse. Great idea! Anytime you can have less paper or have less cards is a great idea in my book. I just use a very low tech version. LOL! I took all of my cards and put them together with a single hole punch and then placed them on a large round circular ring that you get at the office supply store. On my errand day, I take the ring with me. When I get to the cash register, I just give them the card. That way, the cards don’t clog up my wallet. You could keep the ring in your car too so you only have to grab it when you go inside to the store. What a wonderful idea. At last, I have a solution to reduce the height of my husband wallet. Thanks! hope u r now happy with d height of ur husbands wallet..
My main problem is that most of my wallet clutter is not in the form of numbers but in cards with barcodes that get scanned. Now if I could get the barcodes into my phone and get them to scan correctly this would be REALLY nice. Camera phones you might be able to do this with if you can get them the right size and a good quality image. The ones I’m thinking of wouldn’t matter so much if my phone was stolen … Library (when they issue a new number the old one is inactive so someone couldn’t steal a bunch of books in my name), grocery store, CVS … and all of these other “customer discount” cards. Ooo that reminds me, I need to go get something … I’m going to see if I can get their barcode in my phone see if it will work. Am I the only one that thinks this is a bad idea? What if your phone is stolen? Several months ago, I purchased a business card holder and put all of my club cards in it. I keep the holder in my car, so when I’m running errands, I bring it into the store with me and scan the needed card. One of those small wallet photo books would work, too! @Charlene–don’t schools still use a student’s SSN as their ID#? Doesn’t seem like this would be a smart number to keep in your phone. I actually also store credit card details in case I do not have my wallet on me and need to use it for online purchases – I keep those in password protected application called Mobile Secretary – unfortunately not a freeware but not expensive, simple and nice. It can be also used for user accounts, passwords, PIN codes, etc. Another good thing to keep handy in your phone or all on one card in your wallet: phone numbers for EVERY doctor your family sees. Your children’s pediatrician, your mother’s cardiologist… Hopefully you’ll never need them, but it’s worth it to have them with you. In fact, memorize your pediatrician’s phone number. You’ll be glad you did. @Celeste – That’s a great idea! I wish I would have seen it sooner! @Lucas – These days phone = wallet. I’ve got a little thin leather thing that I always keep in my pocket with my phone. I think that thing is where cash used to go, whatever that is. Now it holds my check cards and drivers license. I suppose if your phone gets stolen you’re screwed. Just like if you lose your wallet. I use an app called SplashId for my PDA. It’s not the best password manager for a PDA, I prefer KeePass but either work great. They encrypt passwords, id’s, and credit card numbers and store them in a secure way so that you always have em with you. @Craig – If you lose your cell phone, you may want to think about Backup Assistant. For VZW customers, it’s a free service to subscribe to that remotely backs up all your contacts. That way if you lose your phone, they will automatically download to your replacement phone. I take the low tech option, too, since I’ve lost my cell phone before. I typed and printed membership numbers onto card stock, then cut to business card size. I travel a lot for work, and don’t always know which hotels are in which clubs, so this leaves me with all the hotel/travel club numbers, without the cards. I store the actual cards in my rolodex at work, so I can flip right to them while making the reservations, if needed. @Gayle. Thanks for the concern! No, my student ID # is a line of gibberish, not my social security number. I have my SSN memorized, so no need to jot that one down! One thing I do sometimes is write my Pin number down on cards…well kind of. I have a 4 digit “code” that I use to encrypt my pin numbers. I use something simple, like add the number to my code to equal the pin, either using individual numbers or the whole pin (if my code is 1234 and the number on the card is 2345 then my pin could be 3579). You could also use a subtractive method. Whatever method you use I’d be consistent. As a plus…if the idiot who tries to use your card in an ATM gets the code wrong too many times, which he’s bound to do, the card will get sucked into the machine. Recently, I had a problem with a password to my Earthlink account being divulged. One of the security tips the agents told me was to NOT store my passwords/sensitive data on my cell phone. I started doing this after a recent lost-wallet scare (it turned out that my wallet wasn’t lost, it had just fallen out of my purse inside my house; but if it really had been, I would have had a hard time first figuring out who all I needed to call, and then tracking down the correct phone numbers.) I do the same as Charles, push the number down to the bottom of my phone list with a z at the beginning. I also put in numbers I may need for short-term situations, and remove them afterwards – hotel, shuttle and taxi in destination cities when I’m traveling, for example, listed by city or event name so they’re all grouped together. It can store any information you wish in encrypted form on your computer, which then very simply synchronises with your phone. I use to remember bank accounts, credit card numbers, memership numbers, etc. Superb!